In a thanksgiving Mass for the Apostolic Nuncio, Archbishop Antonio Mennini, celebrated at Westminster Cathedral on 6th February, Cardinal Vincent paid tribute to him as he comes to the end of his post in the UK. Noting that Abp Mennini has always 'looked first for what is good, here in our Church, in the people you have met, in the tasks you have had to undertake' and has tried to engage on this basis. 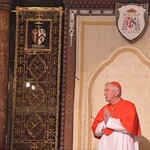 This, the Cardinal said, is 'a great quality' that the Nuncio has shown during his mission here. 'I speak, too, on behalf of so many of your colleagues in the Diplomatic Corps, many of whom are present here with us,' added the Cardinal. Reassuring the Nuncio of the prayers of the bishops and people of England and Wales, the Cardinal noted 'we will continue to be closely with you and support you in the new ministry that lies before you'. Most of the bishops of England and Wales were among the concelebrants of the Mass. Many representatives, past and present, of the Diplomatic Corps were in attendance, including past UK Amabassadors to the Holy See Francis Campbell and Nigel Baker, as well as the Polish Ambassador Arkady Rzegocki and Slovak Ambassador Lubomir Rehak. Archbishop Mennini was appointed Apostolic Nuncio to Great Britain on 18th December 2010 and presented his credentials to Her Majesty the Queen on 2nd March 2011. He returns to Rome to take a position in the Secretariat of State. The Apostolic Nunciature is an eccelesiastical office of the Church and a diplomatic post of the Holy See. The Nuncio to the Court of St James holds the rank of ambassador.